Eso Pre-Funcamp is an agenda of Human and Resource Development Devision. It is a new peogram of ESo, so it was the first time we had Pre-fun camp. This agenda has the purpose to bring close the relationship between the new members and senior of ESo before the real Funcamp agenda. It was hold on January 17th 2015 near the Lampung University’s GSG. Both the new members or seniors were asked to wear sporty clothes because we want to get fun from many active activities there. At that day, sun shone brightly and the air was fresh enough. 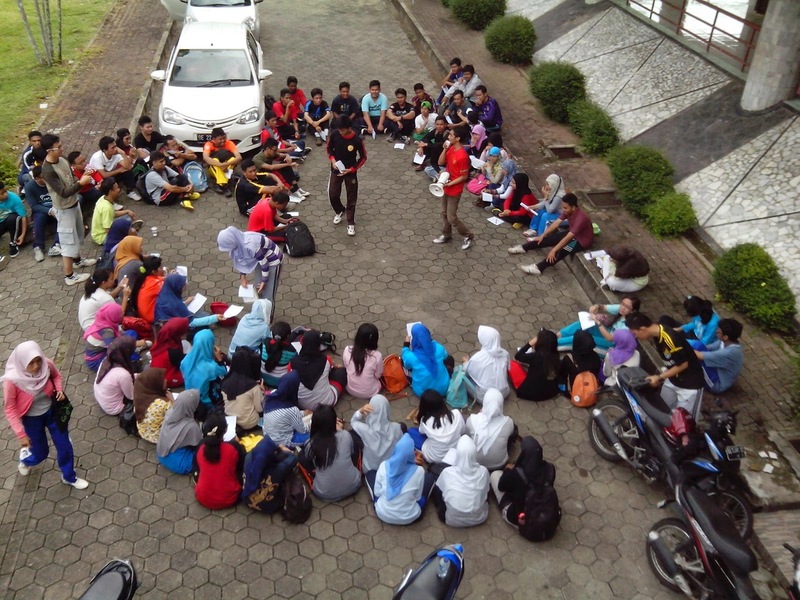 After many people gather beside GSG, we got warming up which was lead by two seniors of ESo. All people do their best to get warm that morning. After aroud 10 minutes warming up, all people did jogging around Lampung University’s campus. There was no wall between seniors and new members. They were mingled each other respectifuly. After around 30 minutes, we were back to beside GSG. While we took a rest, the president of ESo, Taufik Qurrohman, gave a speech welcoming the new members and introducing the senior of ESo who had come there. After the knowing the seniors of ESo, the new members were asked to have a game related to knowing other new members. So, by bringing a piece of paper, each person asked the other names of new members. After having the name of other new members, they were given a challenge related to their memorization of other new member names. If they were wrong, they got a punishment. Luckily, there was no one got the punishment. So, the game were moved to another game. In the next game, the new members were asked to make a group, and based on that group, they were given an instruction to hold an agenda, it could be a competition or seminar related to ESo. They were so exited and from that games, there were many new and inovative idea came from the new members. From those good ideas, the seniors chose the best idea become the winner of that games. Even the prize was not really expensive, but the moment was unforgotable one which will be kept by all of us forever.